The inaugural Ravnica Weekend for Guilds of Ravnica (GRN) is right around the corner. Meanwhile, Ravnica Weekend for Ravnica Allegiance (RNA) is open for scheduling. Ravnica Weekend for GRN is the debut of a new event: Magic Weekend. 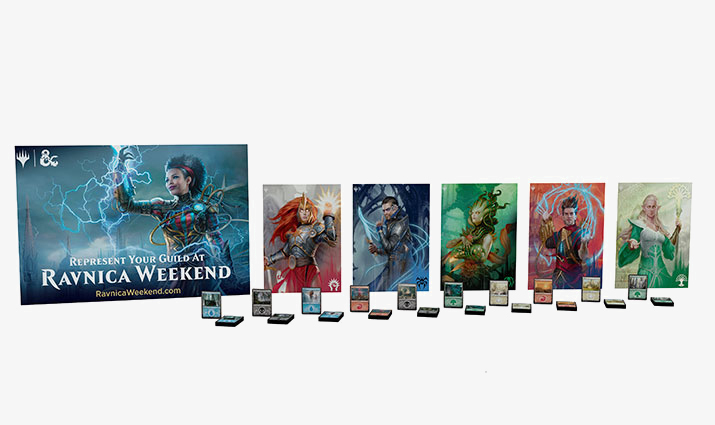 Ravnica Weekend for GRN is the first, and Ravnica Weekend for RNA will be the second, of a new event we're calling Magic Weekend. Magic Weekend is a quarterly mid-season event. It'll be different each time. It's a space for us to experiment, once per season, with new ideas. For example, Ravnica Weekend—both of them—was conceived as experiment with a flavor-focused event: both are all about Ravnica, each in its own way. Ravnica Weekend for GRN is a casual event. Ravnica Weekend for RNA is a tournament. The first difference is the format. We expect Ravnica Weekend Guilds of Ravnica to be more of a social event. You'll run casual four-pack drafts, Guild Kit battles, and D&D sessions based on Ravnica. (The adventure will arrive via email next week.) The prizes are foil basic lands and 11x 14” guild prints. Ravnica Weekend Ravnica Allegiance is another variation of the same theme. It's still all about Ravnica and its guilds, but it's more on the competitive side. First, it's a tournament (at least eight players, at least three rounds, etc. ), and you can choose to run it in either Sealed, Booster Draft, or Standard. Then there's Guild Kit battles, using the new run of Guild Kits coming with Ravnica Allegiance, plus more D&D sessions, using a stand-alone adventure. Don’t miss out on giving your players the best Ravnica experience possible—launch WER and schedule your Ravnica Allegiance events right away.